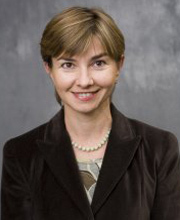 Eva Haviarova is presently Assistant Professor of Wood Products Engineering and Furniture Strength Design in Department of Forestry and Natural Resources, Purdue University. She is responsible for teaching “Furniture and Cabinet Design and Manufacturing” and “ World Forests and Society” courses. Dr. Haviarova is conducting research in areas of Furniture Strength Design and Product Engineering; Direction for Emerging Furniture Design Challenges; Design and Development of Low Cost Furniture for Underprivileged; and Frame Design for Upholstered Furniture. Through her outreach activities she is working on forest products industry promotion projects. She is also a director of The Wood Research Laboratory. She authored or coauthored more than 45 publications and over 70 professional presentations on the subject of forest products, furniture design, and manufacturing. Dr. Haviarova received her M.S. in Wood Processing & Furniture Design in 1992 from the Technical University in Zvolen, Slovakia , where she researched alternative natural materials and taught a course of aesthetic principles and use of natural materials in furniture production. After completing her Master's degree, she worked as an Industrial Engineer in a French-Slovak joint venture furniture company where she was in charge of scheduling production and quality control. She also received a Ph.D. in Furniture Design & Manufacturing from Purdue University. She designed, built, tested, and structurally analyzed school furniture for production and use in developing countries. She researched practical and environmentally friendly solutions for use of wood materials and their residues for furniture construction.